A little over a year ago I reviewed a similar compilation of Kreisler miniatures on a Naxos disc. No less than 15 titles from that CD are also on this EMI disc, including practically all the well-known ones. It is up to the readers to judge whether it is necessary to invest in the present disc for the nine extras. Of course it is good to have a couple of those compositions �in the style of ��, one of which is for string quartet. However, generally speaking, the non-specialist collector should be satisfied with one or the other. The EMI is reproduced from the original matrixes, which of course were not available for Naxos who instead had to work with finished pressings in mint condition. For Naxos, Ward Marston achieved a sound fully comparable to that delivered by EMI. A random selection of A/B comparisons revealed a certain rumble on the Naxos disc but not enough to be disturbing. The quality of the 1938 recordings, made at Abbey Road, was always very good and the 1936 Berlin recordings are not far behind. The ones from 1930 are inevitably more dated but still very listenable. 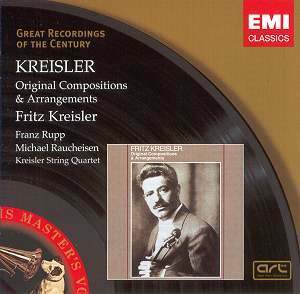 One marvels afresh at Kreisler�s playing: the sweet tone, the light, almost casual phrasing and the perfect double-stops. He executes the tricky fast passages with superior exactness and his rubatos seem part and parcel of the compositions. My intention was to play Caprice viennois (tr. 1) just to refresh my memory and check the sound quality, and then concentrate on the titles that were not on the Naxos disc, but I was immediately hooked and played the whole disc through at one sitting. Of the �new� titles the two Couperin pastiches are not performed as sticklers for authenticity would expect, but they are elegantly done and with that inimitable sweetness of tone and a charming rhythmic lilt in the pavane (tr. 10). An oddity is the scherzo �in the style of Dittersdorf�, played by the Kreisler String Quartet, an ad hoc group assembled to record Kreisler�s String Quartet. One of the members was William Primrose, who remembered the sessions. It turned out that there was going to be a blank 78 side and producer Fred Gaisberg suggested that Kreisler write a filler, or arrange one of his pieces for quartet, which he did at once in his hotel room with Primrose waiting. He then rushed the score to the copyist and the next day it was recorded. It is a fine piece that should be heard more often. I would also like EMI to reissue Kreisler�s full quartet, which I have never heard, apart from the scherzo movement, which the Delm� Quartet included in a disc with encores. Of the other pieces Glazunov�s S�r�nade espagnole is a charmer and Weber�s Larghetto is warmly romantic. The sweet melody could almost be a Kreisler original. Heuberger�s Im Chambre s�par�e, for some reason entitled Midnight Bells is best remembered in recordings by the two Elisabeths � Schumann and Schwarzkopf � but Kreisler caresses the tune just as seductively and adds something neither of the sopranos could do: double-stops! Every lover of violin playing should have these recordings in one version or the other and if quantity is a deciding factor the EMI is the better bet since it offers 78� minutes playing time while the Naxos gives only 67.